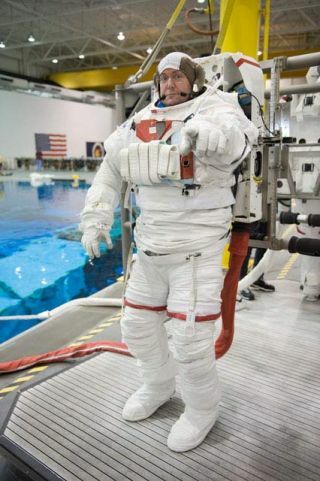 Lead STS-129 spacewalker Mike Foreman trains in the pool at the Johnson Space Center in Houston. Two astronauts will step out of the International SpaceStation today on the first of three spacewalks to stock the orbiting lab withspare parts. Veteran spacewalkerMike Foreman and rookie astronaut Bobby Satcher plan to exit the station at9:18 a.m. EST (1418 GMT). The two NASA spaceflyers are slated to spend about 61/2 hours floating outside to install a spare antenna and complete otherstation maintenance tasks. "To go outside ? and it?s a great view from inside theshuttle ? but outside with just your helmet and that visor in front of you, andpanoramic view of the Earth and the heavens, it?s just amazing," Foremansaid of spacewalking, during a preflight interview. Foreman and Satcher arrivedat the orbiting laboratory Wednesday along with four other crewmembers flyingaboard the space shuttle Atlantis' STS-129 mission, led by commander CharlieHobaugh. The shuttlelaunched Monday to begin the 11-day spaceflight. The spacewalkers' first task will be to unload a sparecommunications antenna from the shuttle's cargo bay and install it on thestation. The new element will serve as backup in case the antenna currently inuse breaks and a replacement is needed. After that, Satcher plans to add some grease to the end ofthe station?s Japanese robotic arm and an attachment point on the outpost?srailcar. Both devices have grabbing mechanisms called snares that can get stuckif not properly lubricated. Meanwhile, Foreman will attach a set of cables anda new handrail to be used during a future mission when a new node is installedon the station. "I?ll spend most of the spacewalk actually flying on therobotic arm, so it?ll be a pretty incredible view because the arm kind of takesyou away from [the] structure and you?re kind of hovering aboveeverything," Satcher said. The spacewalk is crucial for the mission's overall goal of outfittingthe station to prepare for the era after the retirement of the spaceshuttles and their large cargo-carrying ability. NASA's three-orbiter shuttlefleet is due to stop flying in about a year. Atlantis arrived bearing two large platforms full of extraparts to have on hand in case something breaks. One of them was installed onthe station?s main truss late Wednesday. "Having these already there is going to make thingsmuch easier down the road for long term of the International Space Station to2015 or beyond," said lead STS-129 flight director Mike Sarafin. Thursday?s spacewalk will mark Satcher's orbital debut, anexperience he?s expecting to relish. "That?s going to be the highlight, I think, of theflight for me," Satcher said in a preflight interview. "Reallystepping out and seeing the vastness of the view of the Earth and the spacestation and the shuttle and then, of course out beyond. That is going to bespectacular? I hear people describe it and they all say that it has asignificant impact on their perspective overall and it?s a life-changingevent." Mission specialist Randy Bresnik, who is expecting his wifeto give birth to a baby girl Friday, will help orchestrate the spacewalk frominside the station. Shuttle pilot Barry ?Butch? Wilmore and mission specialistLeland Melvin will also assist by controlling the shuttle's robotic arm from insidethe station. SPACE.com is providing complete coverage of Atlantis'STS-129 mission to the International Space Station with Staff Writer ClaraMoskowitz and Managing Editor Tariq Malik based in New York. Click here for shuttle missionupdates and a link to NASA TV. Live spacewalk coverage begins at 8:30 a.m. ET.